Tell me if these statements sound familiar. Hospitals are unprepared to meet the new CMS eCQM reporting requirements. Hospitals will not meet the deadline for reporting eCQMs to the Inpatient Quality Reporting (IQR) program. 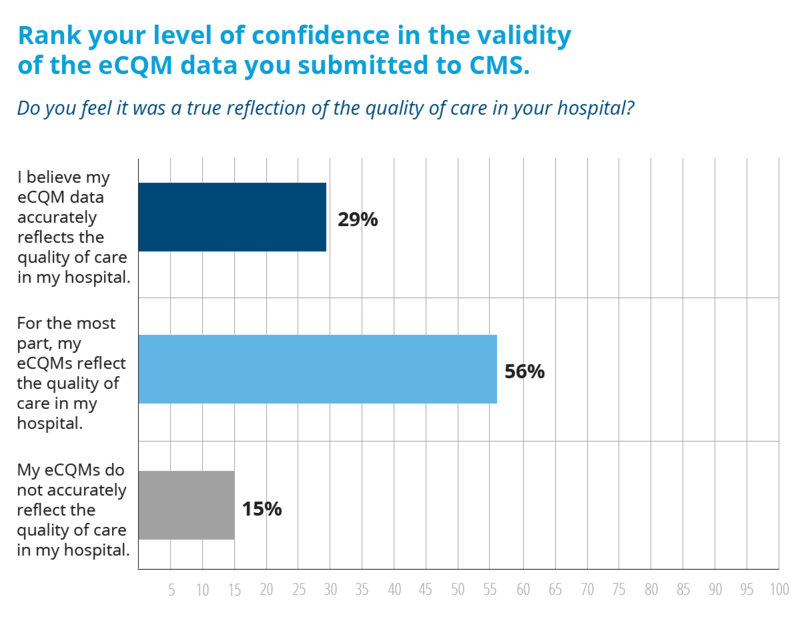 Hospitals don’t feel confident in their eCQM data results. 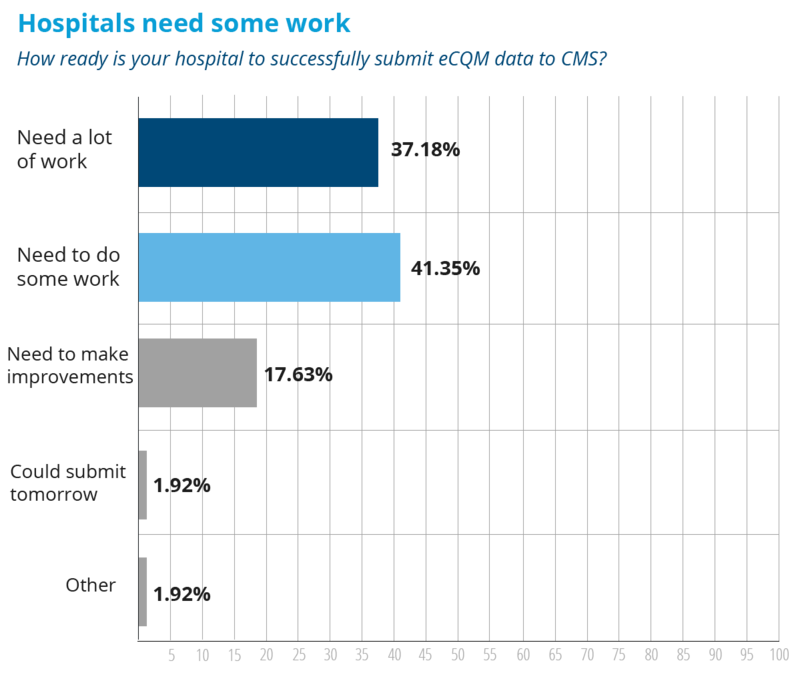 Every couple of months a new survey of Eligible Hospitals paints a pretty bleak picture of hospitals’ capabilities and resources to improve and report on their eCQM data. Well wake up sunshine because we’ve got some good news. In our recent survey of Medisolv hospitals, we found that 85% of hospitals felt good about their eCQM data results. These results are quite a bit different from most of the voices you hear proclaiming that the eCQM requirements are too difficult and that the numbers don’t accurately reflect the quality of care in their hospital. 2016 was the first year that hospitals were required to successfully meet the IQR program requirements. Hospitals had to have submitted no less than four eCQMs from a list of 28 available eCQMs. They had to report on a full quarter’s worth of data from either quarter three or quarter four of 2016. Those eCQMs had to be submitted to CMS before the extended deadline of March 13, 2017. All of Medisolv’s hospitals that took this survey were able to meet this deadline. Also see: Medisolv Achieves 100% Success Rate for eCQM Submissions. Let’s compare those results to a previous survey that was conducted by The Joint Commission back in August of last year. The Joint Commission released a survey which demonstrated that most hospitals were not quite ready to submit their eCQMs to the IQR program. It will be interesting to see how many hospitals actually did submit their eCQMs to the IQR program in its first mandatory year. Hospitals who did not submit their eCQMs risked losing up to two percent of their Medicare reimbursement payments. 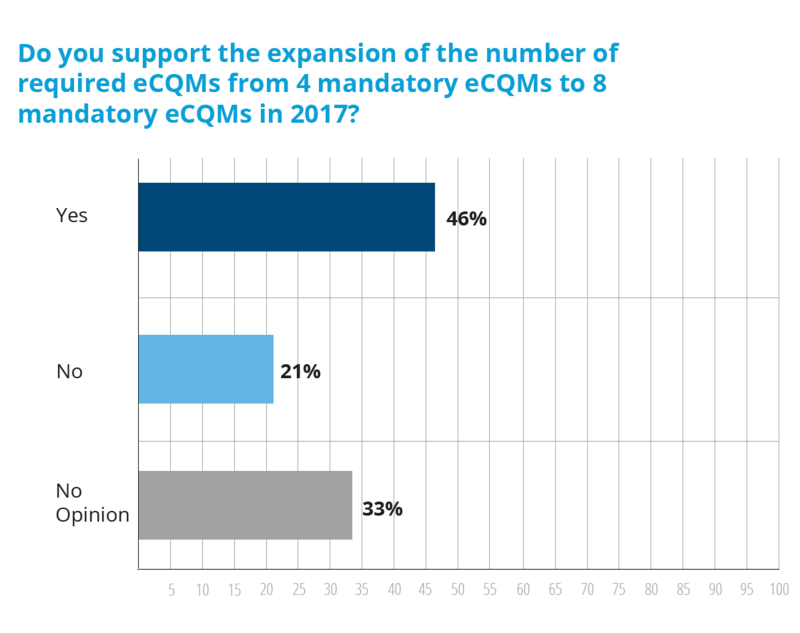 It’s pretty clear from our survey that the majority of our hospitals felt that the mandatory requirement to submit four eCQMs in 2016 was a good thing. It’s not as clear how hospitals feel about this year’s expanded eCQM requirement. In 2017, hospitals must submit eight eCQMs and not just for one quarter, instead they must submit eCQM data for the entire year by February 28, 2018 for the IQR program. Also see: 5 Hospital IQR Program Requirements in 2017. Maybe our hospitals just don’t understand what is required of them in 2017? Definitely not the case. 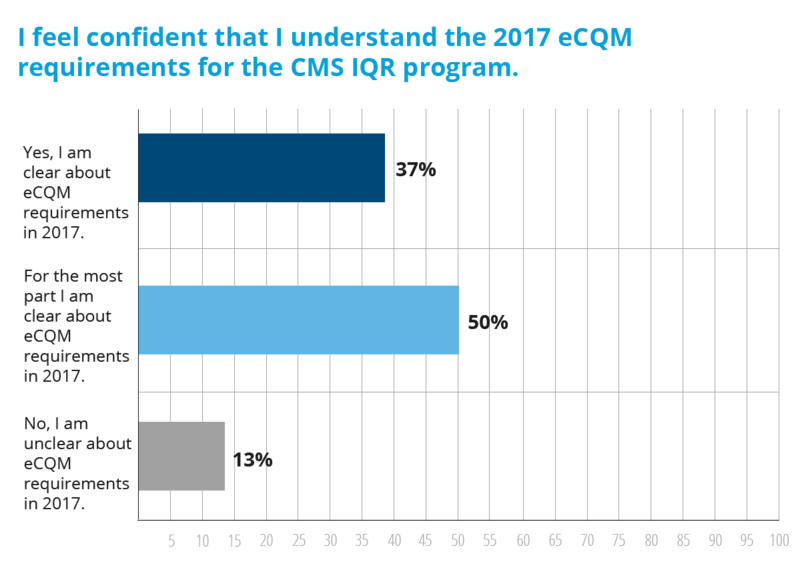 Nearly 90% of our hospitals feel that they have a good understanding of what’s required for reporting eCQMs to CMS in 2017. 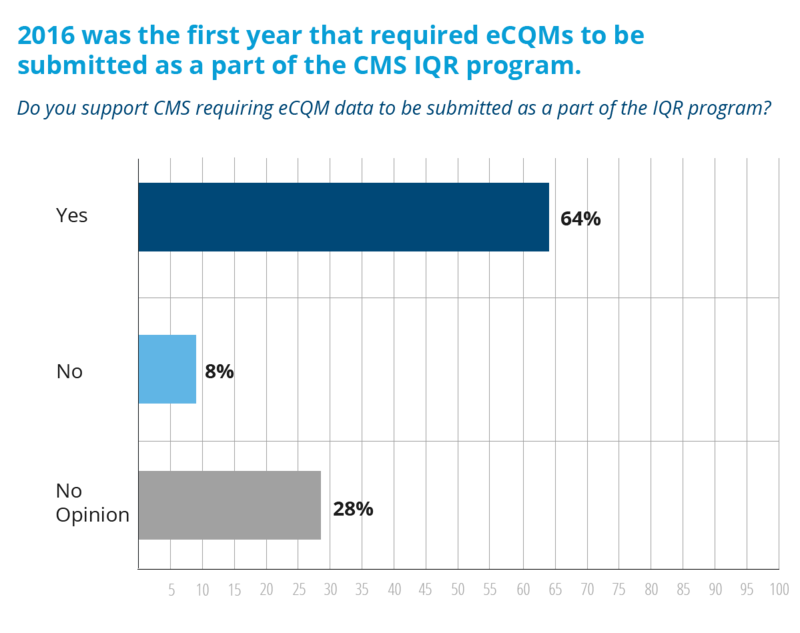 So, while hospitals may not be in love with the idea of expanding the eCQM requirement in 2017, it’s here nonetheless. If you’re a Medisolv hospital, go ahead and pat yourself on the back. By successfully submitting their eCQMs for 2016, validating their eCQM data to ensure it’s a true reflection of their hospital’s quality and educating themselves on the new requirements for 2017, these hospitals are leading the charge for electronic quality reporting.